Uttam Mohanty (ଉତ୍ତମ ମହାନ୍ତି) is one of the most popular Ollywood stars in Odisha. He has to his credit more than 135 Odia films to date and has acted in 30 Bengali films and in the only Hindi film Naya Zaher. He is one of the versatile actor. 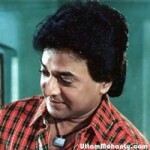 He had dominated the Odia film industry throughout the 80’s and 90’s.